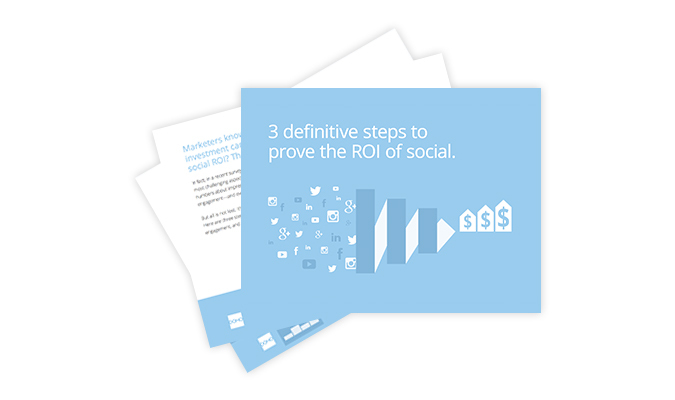 / Calculating social media ROI: A step-by-step formula. Likes are great. We all like likes, and we all like shares, follows, and retweets too. The problem is, how many likes or tweets your social accounts gets is only part of the picture. What you really need to know is how much that engagement is moving the needle. But calculating your social marketing ROI is no easy game. In fact, it can seem downright impossible. If you’re struggling to demonstrate the value of your social media marketing, you’re not alone. As it turns out, 60% of social media marketers say measuring social ROI is the biggest challenge they face, and 50% of marketers in general struggle to connect engagement with their bottom line. That’s a lot of people. And that’s exactly why tracking your social media marketing all the way from click to cash can really give your company a competitive edge. Your marketing campaigns aren’t contained within a single channel, and neither are your social campaigns. Twitter, Facebook, Instagram, LinkedIn—there’s a lot to keep track of. Add to that the costs of designers, social managers, and software, and there’s a lot to juggle. Without a holistic view of every dollar that goes into your social channels, it’s impossible to calculate the revenue generated by them. Not every click generates revenue, and not every like affects the bottom line. But knowing which ones do and how they’re doing it is huge. By tracking every engagement throughout the entire customer journey, from twitter clicks that lead to blog views and newsletter subscriptions, for example, you can get a clear picture of how effective your social campaigns actually are. Once you have the hard part—getting the numbers—calculating your revenue to cost of investment becomes the easy part. By dividing the revenue of each channel by the expenditures that went into them, you now have a solid number you can use to prove the worth of your social campaigns and allocate more budget down the road, which in turn gives you the freedom to take chances and make creative decisions.